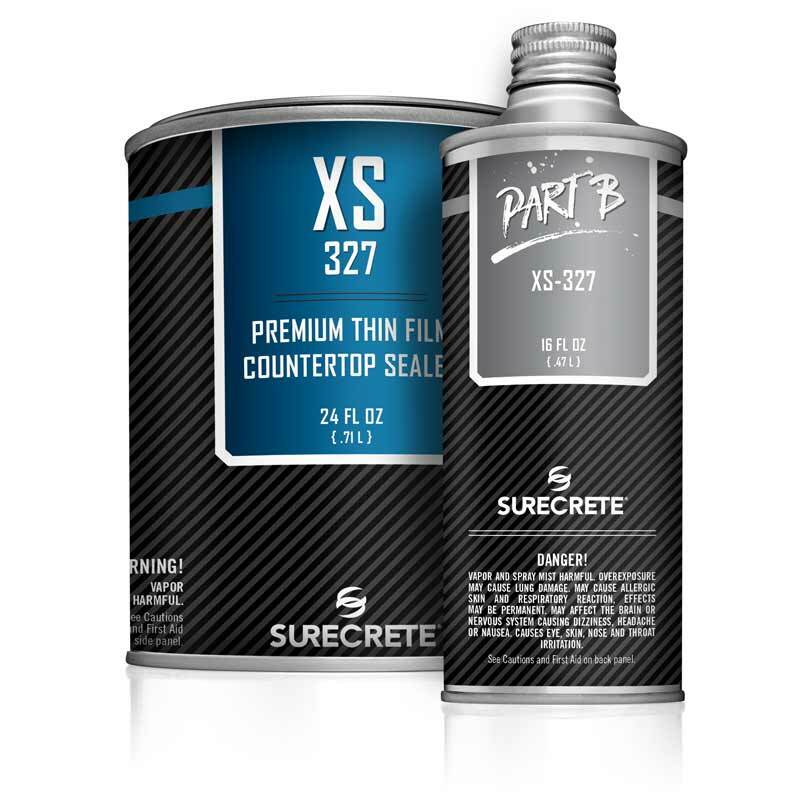 SureCrete’s XS-327 concrete countertop sealer protection is a specially formulated two component water-based, moisture-cure, high solids hybrid polyurethane coating designed for application over completed concrete countertops and surfaces. XS-327 is a penetrating food safe, UV stable, minimal color enhancing sealer, available in both matte and gloss finishes. At 64% solids (varies upon reduction rate) and 25 g/L VOC this high-performance clear top coat generates the premier balance of strength, flexibility, chemical and scratch resistance. XS-327 concrete countertop sealer is ideally suited for both commercial and residential settings applied upon concrete countertops, fireplace surrounds, shower panels, floor tiles, wall panels, and all Xtreme Series products. Like some other sealers, XS-327 countertop protection becomes food safe upon curing. It is stain resistant to most household chemicals and culinary items and is heat resistant to 300°F (149°C). XS-327 is distinctive in its ability to be touched up or repaired. With such a low VOC rating at only 25 g/L, XS-327 is an incredible eco-friendly sealer concrete countertops, after curing, the sealers staining is completely food safe, making it an ideal sealer for use in both residential and commercial kitchens. Also, being a water-based sealer, XS-327 cement countertop coating puts out little to no odor, making it an ideal layer for use in residential applications. XS-327’s scratch and abrasion resistance are also second to none, making it viable for a variety of surfaces. XS-327 is simply the best countertop sealer on the market today. How to Apply SureCrete XS-327 urethane water-based Countertop Protection? Any surface that is about to be sealed needs to be completely cured, clean and free of all contaminants, and fully profiled and etched. Mix 2 parts B and 3 parts A continuously for 3 minutes to ensure complete catalyzation. For the prime coat, add 7 parts water to 1 part catalyzed product and mechanically mix for 2 minutes. Flood surface with xs-327 concrete countertop sealer and work into the surface using a high-density foam roller until the surface is saturated. Backroll the surface with a relatively dry roller using only the weight of the roller. Once the prime coat is dry to the touch, the surface is ready for the first coat. After mixing another batch to full catalyzation, dilute catalyzed product at a rate of 2 parts water to 1 part sealer. Apply XS-327 again in similar fashion as a prime coat, this time with only an even coating, again back rolling to prevent roller marks. Once the first coat is dry to the touch, the surface is ready for the second and final coat of sealer. Mix one more batch of XS-327 cement countertop sealer, then dilute catalyzed product at a rate of 2 parts water to 1 part sealer. Apply countertop sealer in similar fashion to first coat with an even coating and again back rolling to prevent roller marks. 24 hours after second coat of XS-327 countertop sealer is applied, the surface is ready for light use, and is fully cured and finishes safe for food after 7 days. Question: Is XS-327 counter topping food safe? Answer: After the full cure is achieved in 7 days, XS 327 seals concrete surface making it a completely finish food safe sealer. Question: Can it be used on wood finishes? Answer: Although our sealer is formulated for concrete surfaces, we have had wood finishers use 327 with success. Question: How long do I have to wait between coats? Answer: Only until the sealed surface is dry to the touch and not tacky. If allowed to sit more than 12 hours, the surface will need to be sanded with 220 grit sand paper to ensure proper adhesion. Question: Do I need to use multiple coats XS-327? Answer: Yes, the prime coat is essential for good penetration of the sealer, and it is much easier to apply at dilution rates of 2:1 and 1:1. “Straight-up” application is never suggested. What do I do if the counter has been previously sealed with an acrylic sealer and the acrylic based filler? Chris, Thank you for the great question. In an ideal world the previous coating should be stripped. However this is not always possible. One reason is the mess it can cause inside, the other is the color enhancement the acrylic provided you will not achieve with XS 327. To recoat acrylic is possible. First wipe down with denatured alcohol. Then the surface must be completely sanded so no sheen is left. Usually 100 grit. Then another alcohol wipe. You can recoat with two coats of XS 327 at a 1 to 1 dilution with water. 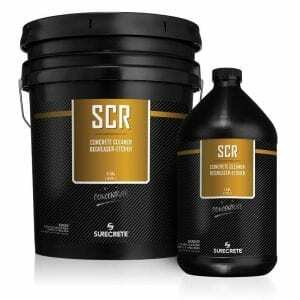 Is this the best product to achieve an enhanced, high gloss finish for a concrete countertop? 1) How much time, do you have to wait, from first coat to second coat application? 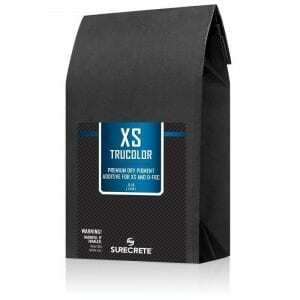 2) If it’s a brand new concrete countertop, what do you need to do, prior to applying your XS327 sealer? Thank you for the great Question! : Before sealer application, Xtreme Series cast products must hydrate out of the mold for a minimum of 12 hours depending on temperature & humidity. Any standard concrete must be sufficiently cured to have complete hydration, approximately 14 days depending on temperature & humidity. 1. If first coat is dry to the touch, proceed with a second coat. compressed air or lint-free rag. product remains 2 parts water to 1 part catalyzed mix (2:1). and the surface is ready for full use. I purchased SureGrip HD Additive with the intention of adding it to the XS-327 while sealing a shower floor…However, the label seems to specify use with “acrylic” sealers…is the SureGrip compatible with XS-327? Hi Amy, Thank you for the Great Question. SureGrip was “Not” designed to be used with XS-327. It was designed for acrylic and Polyurethane Floor sealers. Hope this helps. Will you ship to Nova Scotia, Canada? Im using this on a bathroom countertop with integral sinks. I didnt follow the directions correctly on the primer coat. I mixed the 7:1 ratio to the portions of what part A and B were (50mL each). So my primer coat was in actuality more like 7:5. The surface after 2 coats is still tacky and bumpy. Realive humidity in the house is around 50%. Can you recommend next course of action? I have Tabletop that came with Sika sealer on it. Can I out this on over top? If not what kind of surface prep must i do? Thanks. 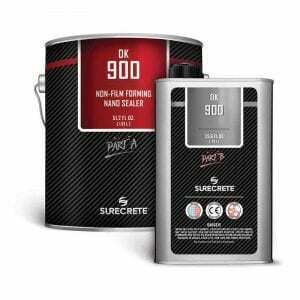 Thank you for your great question, XS-327 is a penetrating sealer so it must be able to penetrate the concrete surface to achieve maximum results. It may be necessary to grind/sand surface to make sure XS-327 can “soak in” A good test would be to add water to the surface, if it soaks in then XS-327 will work properly. 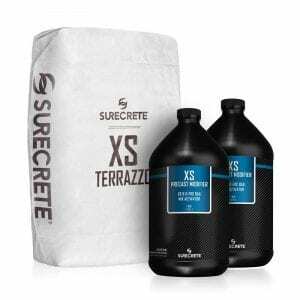 Hope this information helps, please feel free to reach out to a SureCrete Rep. anytime for more information. 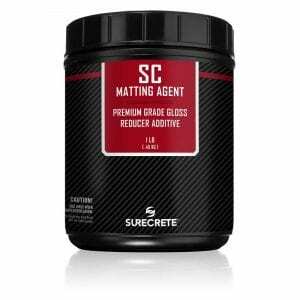 I’ve read a few reviews that this product will significantly darken the concrete and give a brown tone to it. Trying to make a decision on the stain under the sealer and was wondering if this was a common issue. It could, however, it is not manufactured for color enhancing. Please test a small area first by applying water; this could be close to the final color. In your catalog, it mentions that the XS-327 has a burnished application. What exactly is a burnished application? Thank you for the great question, Please contact a SureCrete Rep. at 1 (352) 567-7973 and the can give you more details on how this can be done. Does XS 327 have enough heat resistance to handle hot pan coming off the stove top or oven. Yes, just like any hard surface, avoid prolonged exposure. 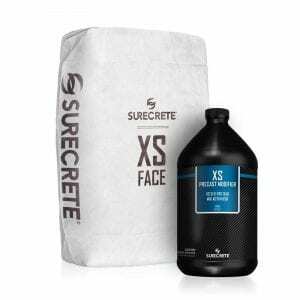 SureCrete XS327 is a premium concrete countertop sealer that when fully cured is a food-safe clear coating. Available in gloss or matte finishes, XS-327 is a water-based polyurethane that is UV stable and scratch resistant clear concrete sealer. Can I apply this product over a clear epoxy to help with scratch resistance? We put a fresh coat of XS-327 on this table this morning. It has been outdoors for exactly 2 years tomorrow and looks like the day we installed it. Used XS-327. Great product, easy to use and looks fantastic! Tech support for “on the fly”product info and application tips are excellent. Thanks to Madilyn and Patrick! Thanks guys! XS-327 is a water based polyurethane concrete countertop sealer that can create a matte or gloss finish which is highly durable, scratch resistant, food safe, and can handle high heat. I bought this product to go over my Cheng Concrete precast countertops in Charcoal color, and I am SO glad I went with this sealer over the generic stuff I had used on my small bathroom countertop (not food safe, not poly based, etc), or the Cheng sealer I was considering. I just happened to call Surecrete tech support to ask about color-matching my slurry, and the tech support guy reminded me to use a quality sealer in my kitchen. This is truly an outstanding product. I approached the application of this sealer with more than a little trepidation, as I am literally the world’s worst painter. However, it actually goes on very easy and seems rather forgiving. Following the manufacturer’s directions closely, I found it easy to apply the primer coat and then two additional coats. I finished my 50 square feet of countertop in about 2-1/2 hours, and they look AWESOME! The colors just pop, and the product went on nice and even and simply gorgeous. I can’t recommend this sealer highly enough for kitchen countertops, which is what they are designed for. Thank you for the Great compliments, Mike!